Why Platinum Fashion Mall is special ? Platinum Fashion Mall is like an indoor version of the Chatuchak Weekend Market. It specializes in wholesale fashion clothing and accessories, with four floors of shopping space, packed with some 1,300 shops. Here, haggling is part of the fun, and you’ll save more buying in larger quantities. 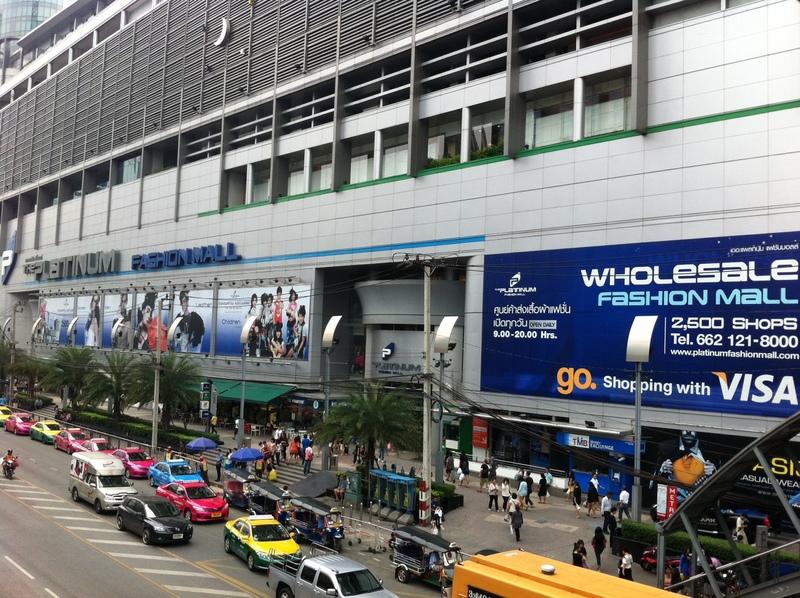 Platinum Fashion Mall location is smack in the centre of Pratunam, a 10-minute walk from either Ratchathewi or Chidlom BTS Skytrain, so it is easily accessible when compared to other clothing bazaars of the same scale. Plus, it’s air conditioned and comes complete with a large food court as well as cafés and fast food chains. There's even a four-star hotel, Novotel Bangkok Platinum, on top. Talking about a one-stop shopping for reasonably-priced clothes and accessories, Platinum Fashion Mall is your best bet. What to explore at Platinum Fashion Mall? There’s not much to the concept; it’s a wholesale shopping mall filled with small outlets, selling mostly women’s fashion and accessories. Each floor of Platinum Fashion Mall is named after famous shopping districts around the world, namely Orchard, Nathan, Ginza, Soho, Oxford and Camden. Roughly, the four floors of retail shopping space are dedicated to men’s and women’s clothing, leathers, shoes and fashion accessories. The range of styles and what’s available is more than impressive. Find everything from children’s wear, adolescent clothing, jeans, evening dresses, underwear and oversized clothing to wigs, belts, shoes, handbags, hats and cosmetics. Specialty shops are interesting too, with imported fashion from Korea, Hong Kong, Japan, China, India, as well as niche fashion, such as oversized clothes, elderly lady’s fashion, chiffon dresses, cowboy clothes, costumes, and more. Basically, you can find anything to embellish yourself with from head to toe, so it’s a good idea to do some mixing and matching in your head as you browse along. And don’t hesitate to buy when you see something that you like or you may not find it again. How to get to Platinum Fashion Mall? For infants and kids go to the top floor and you'll find a few shops selling at wholesale rates and the quality was good too. While it's mostly for women, it has nice shops for mens and kids as well. Only cash is accepted. Don't forget to bring cash. Don't forget to bring water along you, you may spend many hours here. Bargaining can be done at certain shops though most shops these days have fixed prices. This place also has a food court on 6th level, with Indian food. There are many line signs so you needn't worry about getting lost. Don't worry about the heat as the area is all air condition. Platinum Mall offers a very wide range of products and you have many selections to choose from. Prices are very cheap with a wholesale mall when you pay more than one or two items. Therefore, the more you buy, the more you have a chance of getting a competitive price. There are also are plenty of options in terms of food. The lanes in Platinum are narrow so this also means that weekends are a brutal time to visit, as foot traffic is slow moving. The best time to hit Platinum is in the morning on a weekday, right after the mall opens at 9 a.m. The drawback is that the retailers are not so friendly and tend to be rude at one point. They have the policy of no-trying, no-exchange and only in wholesale buying. As a result, None of the shops let you try on clothing, which means you have to be extra careful about what you buy. Almost the dresses, pants and shorts are appropriate for women that they are designed to fit women of a slimmer build. Consequently, this place is not suitable for men.